LARGE-SCALE testing work is being carried out near Nirranda’s carbon capture site with hundreds of transmitters planted in district paddocks. 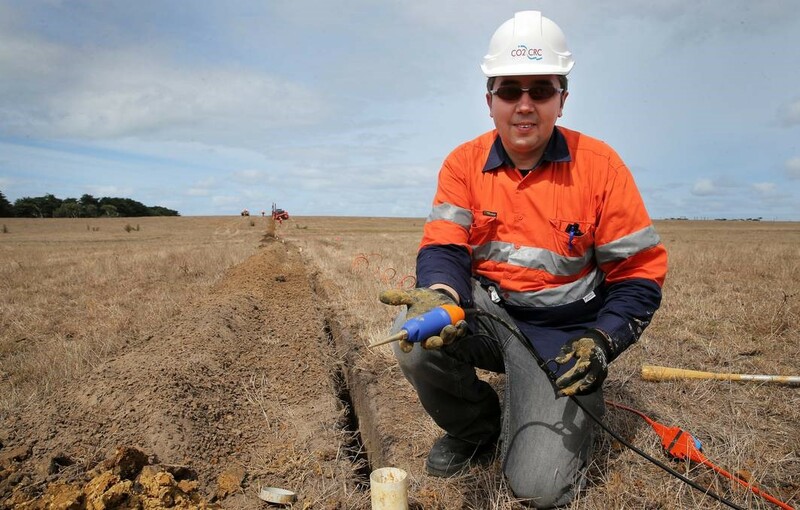 More than 900 geophones are being planted in fields near the C02CRC Otway Project to monitor conditions beneath the surface. The geophones, small monitoring devices about the size of a chocolate bar, are planted several metres below the surface in a system connected by 11 kilometres of fibre-optic cable. CO2CRC chief executive Tania Constable said the new system was an important way of measuring the success of the initiative. “We are able to develop and test monitoring systems, and verify models on movement and stabilisation of the carbon dioxide, allowing us to develop new systems that industry can use,” she said. Operators said the monitoring equipment will allow scientists to understand how the injected carbon dioxide will stay within the district’s rock formation. They said using the same well for multiple experiments has a number of advantages including minimising impact on the landscape and reducing cost to the project. The process of installing the geophones will wrap up next month with initial survey work to take place soon after. Operators have scheduled the injection of 15,000 tonnes of carbon dioxide in November and December, with further monitoring to take place after that has occurred. The project is jointly funded by the federal and state governments.